What is Ping an Village? To take a breather from the crowded city roads and the polluted streets, take a break and visit Ping An Village. Located at the top of the rice terraces in Longsheng County, Ping An Village is at an altitude of 1200 metres above sea level. Enjoy time out from your Lonsheng tours to gather peace of mind and witness the original and unchanged lifestyle lived every day since the time of its inception of the late Qing Dynasty as well as Zhuang Cultures and customs. Inhibited by more than 300 people, Ping An Village has to offer a delightful view to the visitors from various regions of the world and China. It is a mix of a well laid out rice plantations and step farming with maintained wooden buildings from the original village. The visitors can spot the local people raising & feeding their cattle as they walk across the widespread land blessed with natural scenic attractions. Local pets also remind you of a time when people used to keep chickens, cows, sheep and other farm animals on their priority list. The lifestyle followed in Ping An Village is slow and forgiving and you can actually witness the locals and their happiness in absence of greed for money and lust for technology. It is a world untouched and un-scandalized by modern equipment. Every season has blessed this region with different scenic beauty. In summer, the visitors can witness the budding of planted seeds and a mix of green and beige landscape. It winter the entire fields are covered with terraced snow which ensures a good harvest for the next season. The fall witnessed the ripening of rice making the entire land golden and joyous for the farmers and the visitors. Spring has to offer a mixed reflection of silver streams and green fields working in tandem to make photography for visitors a pleasure. Visit Ping An village to lose yourself in a pure world all over again. 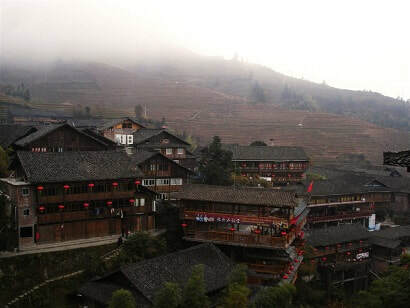 Interested in visiting Ping'an Village on a Tour? Wendy Wei Tours offers a variety of different packaged tours as well as custom tours including Ping'an Village, among other attractions and destinations. To find out more, please visit our Tours page or Contact Us directly to find out more.